Anyone who is willing and ready to follow Jesus must be prepared to face persecution in the hands of those who hate righteousness, justice and truth. This happened to Jeremiah as we have it in the first reading and it also happened to Christ himself. When greed and selfishness dominates our being, we will no longer be considerate, instead we will strive to have everything to ourselves and in doing that we will oppress, manipulate and even kill in order to stay on top. Jesus' explanation in the gospel reading shows us that God's standard of greatness is different from the standard of men. If we truly want to be counted as great and first in God's Kingdom we will be ready to lay down our lives in service to others. We must try to be like Jesus, who inspite of the fact that He was in the same equality with God, did not cling unto that equality, rather He emptied Himself and took the form of a servant in order to save us. We must be ready to serve others in this life as Jesus did and has continued to do for us. Positions and status of authority should be used for service and not for personal enrichment. If we can understand this from the standpoint of our Lord Jesus Christ, our world will be a better place. We need men and women who will be ready to care for others and make sacrifices that will benefit everyone around them. If you are not ready to sacrificially lay down your life as a ransom for others as our Lord Jesus Christ did for us, it will be very difficult for you to enter into heaven. 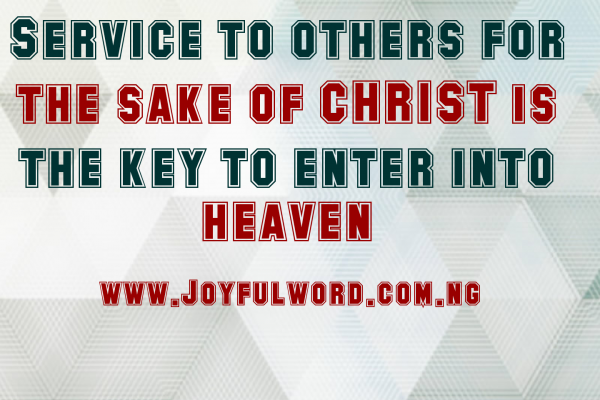 Heaven is for those who use their positions in this life to make positive impact in the lives of others. We must show that we love God by loving our neighbour and that will give us a place in heaven on the last day. Good morning dearest one. SmileðŸ˜Šas you do your work and do have a splendid day. May Jesus give you grace to be willing to serve others so that you may enter into heaven on the last day. Amen. *And May the Almighty God bless you: the Father and the Son and the Holy Spirit. Amen. Watch-Word: The greatest among you must be your servant. To struggle to be the first and greatest is not the issue, but what you do when you get to the top is what matters. #Use your position to serve God in the people.